Sunrise Festival I & II is emerging as Citrus Town Center, the fresh new shopping destination in the Sunrise Market Place. Home to more than 30 stores & restaurants, Loehmann's Plaza is a distinct shopping experience. Fountains at Roseville is the premier shopping destination for the greater Sacramento region. The dominant shopping destination serving the Greenhaven/Pocket trade area is Lake Crest Village. Inter-Cal is a full-service property management and leasing company serving Northern California. Inter-Cal also provides design, project management, maintenance and marketing for all retail, commercial and residential projects. At Inter-Cal, we believe in investing not only in the land, but in the people and communities in which we develop properties. Our developments and their communities grow harmoniously together. Our retail centers and residential properties provide full-service opportunities for communities' residents and also increase the economic viability of the environment. We also pride ourselves on reaching out to the communities in which we have developments, engaging in many local civic and social activities. Celebrate the completion of our beautiful 4 million dollar remodel! 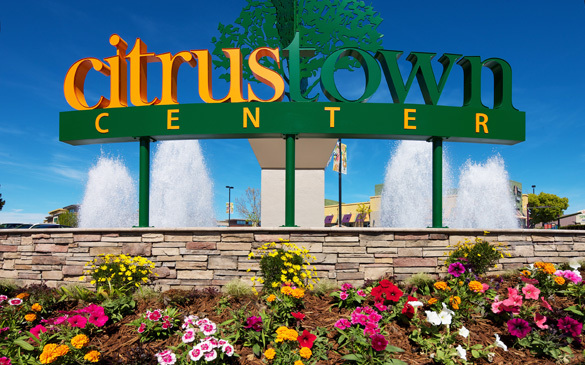 The center now features a new center name, “Citrus Town Center”, all new facades, new awnings, outdoor seating areas, revitalized landscaping, full wall murals and new monument signage; including an over 26 foot water feature on the corner of Greenback Lane & Sunrise Boulevard.